The Okonski’s descendants of Macij (Mathias Okonski), Gen 3 (see below) migrated to United States from Prussia-Poland in 1873 through Netherlands. Macij, his wife Marianna Nyka Okonski and Joseph their 20 month old son, arrived at Ellis Island in New York City on vessel, Cambria, on October 4, 1873. They migrated to Pennsylvania where they resided for 7 years to work and save enough money to buy tickets on a vessel to Galveston and then by wagon train to Bremond, Texas in 1880. Detail information and many pictures for this Okonski Family short story below and for additional information such as various Family Stories, Family Tree, Favorite Recipes, Good Ole Jokes and many other related Okonski activities over the past 120 years are located on the “OkonskiFamily.com” website. The Okonski Family Tree is maintained by Mark Okonski and OkonskiFamily.com website is maintained by Gene Okonski with their contact information for both on the website. More research is required especially in Poland for Gen 1 and Gen 2 below to determine the Okonski relatives prior to 1750 and where (if any) of Macij 7 brothers and 2 sisters migrated to Unite States or any other Countries. Any assistance for many of the Family Stores including some old pictures for Gen 3 and Gen 4 below would be most appreciated. Macij is the 10th child of Jacob Okonski, born in 1780, who is Generation 2 below. Macij, his wife Marianna, and son, Joseph, settled on Tidwell Prairie in Bremond, Texas. Macij and Marianna had 7 children (see Gen 3 below). Marianna died October 15, 1892. Macij married Michalina (Annie) Jerzek Fojut and had 4 stepchildren for a total of eleven children. Joseph Okonski, born March 15, 1871 in Znin, Poland married Victoria Szturemski on November 16, 1892 (see Gen 4 below). They begin living and raising their family of 10 children in a house known as the “Okonski Homeplace” on Tidwell Prairie. The “Okonski Homeplace” still stands and has been livable for over 120 years. All Joseph and Victoria’s ten children were born in the “Okonski Homeplace” house. The first child born in the house was Frank Okonski on September 15, 1893. Besides farming and ranching, Joseph harvested wood and utilized an old timey sawmill to cut logs for barns, wood for lumber, and wood for burning in wood and cook stoves. He also had several horse teams with various horse- drawn equipment and cut hay, planted and plowed cornfields and cotton fields for hire. He grew tobacco, large gardens and raised various livestock and poultry for sale. Joseph also worked on roads and bridges. Joseph took a team of horses and wagon to Galveston in 1901 from Bremond for a whole year to construct the Galveston Seawall after all the destruction and more than 5,000 people that died in the hurricane that hit Galveston in 1900. 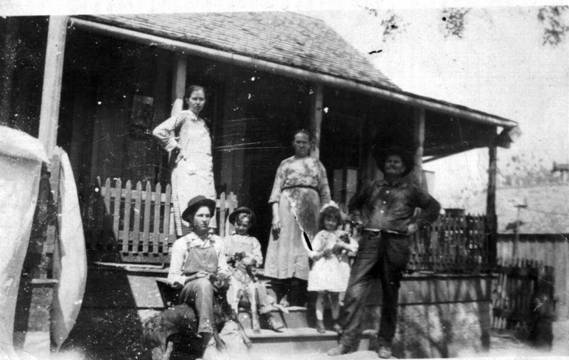 The first picture taken on the steps and side porch of the “Okonski Homeplace” house was in 1921. 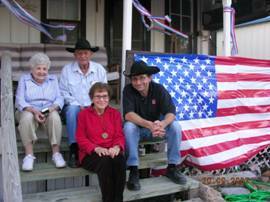 Joseph and Victoria Szturemski Okonski, sons, Edward and Marion Okonski ,and daughters, Theresa Okonski Wilganowski and Pauline Okonski Mushinski are standing or sitting on the steps of the “Okonski Homeplace”. The large porch, columns , windows, and doors and the location of the steps are currently the same in 2012 as in 1892 and 1921 when above picture taken. House, corn crib, and other smaller buildings were built in 1880’s. 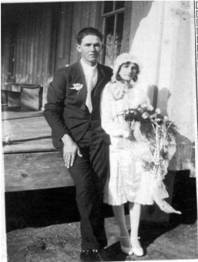 Edward L Okonski was born August 8, 1906 and married Helen Novak on November 12, 1929 (Gen 5 below). They stayed in the “Okonski Homeplace” while Ed’s parents, Joseph and Victoria and their remaining children at home, moved 1 mile closer to town on Tidwell Prairie. Ed and Helen began raising their family with seven children born in the “Okonski Homeplace”. Electricity was finally brought to the “Okonski Homeplace “ in 1949 with only five lights and two additional plugs for appliances. Ed and Helen could only afford the radio for the first year and lights were seldom on and never after 9:00 pm. Gene remembers having to turn the kerosene lamp on and lights off at 9:00 pm even into the early 1960’s to complete his high school homework. The refrigerator came in 1951 which reduced all that additional canning of sausage links and patties to store for future meals. A visit twice a month to the locker plant in Hearne, Texas was always on schedule to bring some beef back and some chicken or fish taken. Growing and selling from a one acre tomato patch, a very large garden, various type of poultry, an occasional calf or hog, and other items such as geese feathers, eggs, watermelon and various fruit were the primary source of income for the family. Additional income came from working for other people for such things as chopping corn and cotton, harvesting corn and cotton and many odd jobs utilizing horses, mules and horse drawn equipment. Edward, oldest son, remembers driving to Bremond’s tomato plant with 21 bushels of tomatoes on a Model A Ford with all seats out and replaced with bushels of tomatoes and coming back with 22 bushels of tomatoes and a $1.00 check. Since Ed just graduated from high school, Dad realized that it was time to send him to Houston to get a job and send some money back on a monthly basis to help keep the family going and ensuring the remaining children received a high school education. A propane gas stove replaced the cooking wood stove in early 1950’s and a water pump was finally hooked up in late 1950’s. 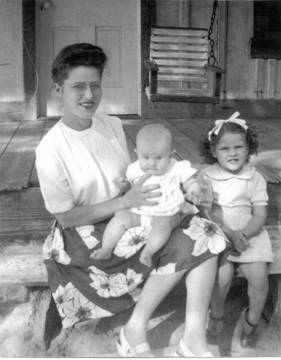 Ed and Helen’s seventh child, Helen was born on May 30, 1955. The first child was named Ed and last child was named Helen after Mom and Dad. All seven children were able to graduate from Bremond High School, find good jobs, raise their own families and help support their parents throughout their remaining years . 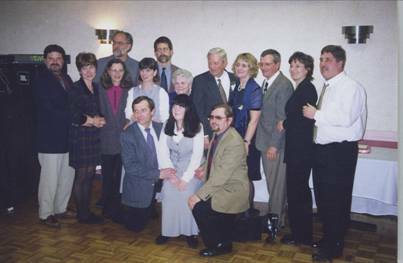 Many of the Okonski’s continued to visit or spend some of their vacation time from Chicago, Houston and many other cities and states in the Union. They enjoyed all the fresh vegetables, homemade bread, fresh chicken/beef and homemade pies or cakes, riding the horse drawn wagon, hayrides with tractor, fishing, swimming in the pond, making homemade ice cream, and visiting/sleeping on the porches. Many of the other Okonski’s moved to Houston or Chicago to find jobs and continue to raise their families especially after many went through two World Wars, the Depression, and the continued difficult life trying to make a fair living farming their land in Bremond, Texas. Ed and Helen celebrated their 50th wedding anniversary with their picture and seven children taken in November 1979 at the “Okonski HomePlace”. 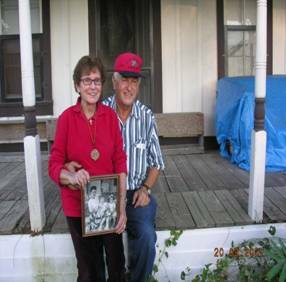 Ed and Helen moved from the “Okonski HomePlace” on Ed’s 80th birthday or August 8, 1986 to a house on N Main St in Bremond, Tx. Gene Okonski (Gen 6 below), the 3rd son of Edward and Helen Okonski purchased the remaining 1 acre of Okonski Farms and “Okonski HomePlace” house in 1986. 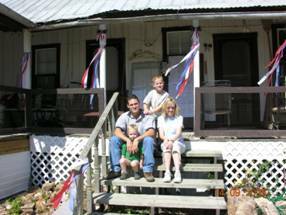 Gene’s son Kevin (Gen 7) and wife and grand-children Tyler and Anthony Ryan (Gen 8) have/had frequent visits to the “Okonski HomePlace” assisting with the various operating tasks and many social events including several Catholic Masses and many Family Reunions . Edward Okonski, oldest son of Edward and Helen, and wife Janie already have great grand- children that have started the next generation (Gen 9) who have also visited the “Okonski Homeplace”. 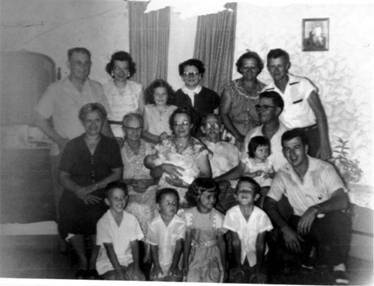 Seven of the nine Generations of Okonski have been at the “Okonski Homeplace “ house. 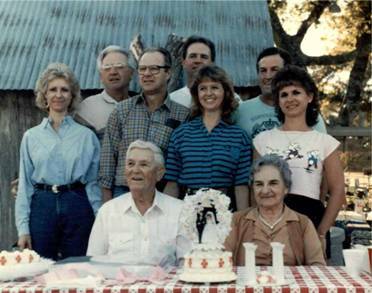 Farming and ranching were the primary operations of the Okonski Farms for the past 120 or more years. The house, old corn crib, chicken house and a couple other buildings have also survived the last 120 years. Anytime a storm was nearby, Mom and Dad’s Mom, would light candles and made a sign of the cross on the windows which probably protected the house during all these years. The Poland/Bremond Okonskis’ are related to many of the Polish Families from Bremond, Texas and are located in many cities in Texas and many states in United States. Macij, his wife, and son, Edward and Helen and many immediate family relatives are buried in St Mary’s Cemetary in Bremond, Texas. Gen 1 – Jacob Okonski – Born in 1750 in Prussia- Poland and married Eva Boianska. Gen 2 – Jacob Okonski -- Born in 1780 and died on January 3, 1845 in Slabomierz, Prussia-Poland. Jacob married Hedwig Przybylski on Feb 9, 1812 in Gorzyce, Prussia-Poland. Hedwig was born in 1779 and died Aug 12, 1822 in Slabomierz, Prussia-Poland. Jacob married Marianna Majchczak on Jan 27, 1823 in Gorzyce, Prussia-Poland. Jacob had 10 children. Gen 3 – Macij (Mathias Okonski) – Tenth child below. Valentine (1st child) born to Jacob and Hedwig on Feb 7, 1816, in Gorzyce, Prussia-Poland and married Apolonia Brzyka on September 8, 1849 in Gorzyce, Prussia-Poland. Rosali (2nd child) was born Sept 3, 1828 in Slabomierz, Prussia-Poland and married Joseph Michalski on May 29, 1849 in Gorzyce, Prussia-Poland. Joseph was son of Mihael Michalski and Marianna Szlotoski. WawrZeniec (3rd child was born in Jul 24th, 1824 in Slabomierz, Prussia-Poland. Anna (4th child) was born on Jul 29, 1826 in Slabomierz, Prussia-Poland. She married Andreas Felcyn on Feb 9, 1846 in Gorzyce, Prussia-Poland. Andreas was son of Thomas Felcyn and Marianna Kujawa Felcyn. 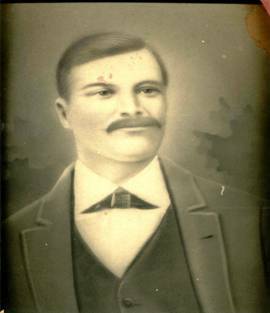 Joseph (5th child) was born on Feb 18, 1833 in Slabomierz, Prussia-Poland. He died February 22, 1834 in Slabomierz, Prussia-Poland. Paul (6th child) was born on Dec 27, 1834 in Slabomierz, Prussia-Poland. Michael (7th child) was born Feb 3, 1837 in Slabomiercz, Prussia-Poland. Adalbert (8th child) was born on Apr 23, 1839 in Slabomierz, Prussia-Poland. He married Agnes Felcyn on Oct 20, 1861 in Gorzyce, Prussia-Poland. Agnes was daughter of Antonius Felcyn and Katarina Bryk-Felcyn. Simon (9th child) was born on Oct 9, 1841 in Slabomierz, Prussia-Poland. Macij (Mathias) (10th child) was born on Feb 23, 1844 in Slabomierz, Prussia-Poland. He married Marianna Nyka on May 25, 1869 in Znin, Prussia-Poland. Marianna was born on Jan 29, 1850 in Skarbience, Prussia-Poland. She was daughter of Joseph Nyka and Barbara Cieslak. Marianna, Macij and their 1stth son Joseph at age 20 months took passage on the vessel "Cambria" and landed at Ellis Island in New York City on Oct 4, 1873. Gen 4 – Joseph Okonski – Macij and Marianna’s( 1st child) was Joseph Okonski born March 15, 1871 in Prussia-20 months old when he and his parents took a several week ocean boat ride on vessel “Cambria” from Prussia-Poland to the Netherlands and then to Ellis Island in New York City arriving on October 4, 1873, They continued their trip to Pennsylvania and had to work for seven years to save enough money to take a vessel trip to Galveston in 1980 and by wagon train to Bremond, Texas. Joseph married Victoria Szturemski on November 16, 1892 in Bremond, Texas. Josephine Okonski (2nd child) was born Sept 1877 who married Frand (Snider) Suchowiak on October 7, 1896. Catherine Okonski (3rd child) was born Oct 26, 1877. Stephen Okonski (4th child) was born Dec 26, 1880. 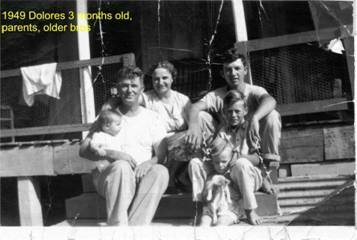 Helen Mary Okonski (6th child) was born on Apr 11, 1889 in Bremond. Helen married Frank Krysinski from Marlin on Oct 2, 1910. Helen died April 21, 1967. John Okonski(7th child) was born on Dec 17, 1889. He married Veronica Budzis Buckner on Jan 21, 1914. John died Dec 11, 1985. Josie Fojut (1st step child) was born on Oct 1983. Gen 5 – Edward L Okonski – (6th child of Joseph and Victoria above). Gen 6 – Children’s names are listed below their Gen 5 parents. Frank Okonski (1st child) was born Sep 15, 1893. He married Josephine Celunak. Frank died Aug 6, 1966 and Josephine died Jan 5, 1972. Mike Okonski (2nd child) was born on Jun 23, 1895. Served in World War I and died Jan 2, 1926. Stanley “Stash” Marion Okonski (3rd child) was born on Feb 4, 1898. Married Louise Pauline Burda. They operated the “Blood Bucket Saloon” which hosted many weddings and dances. Stash died Nov 22, 1983 and Louise died Apr 22, 1975. Bruno Okonski (4th child) was born Feb 9, 1901. He married Victoria Novak. Bruno died on Aug 12, 1971 and Victoria died on Oct 24, 1999. Theresa Okonski (5th child) was born Oct 14, 1903. She married Edmond Wilganowski. Florence Okonski (7th child) was born Mar 23, 1909. She married John Wilganowski. Felix Okonski (8th child) was born October 6, 1911 and died in 1914. Marion John Okonski (9th child) was born Dec 2, 1914. He married Pauline Nobra. Died Oct 4, 1997. Pauline Okonski (10th child) was born Mar 7, 1918. She married L.B. Mushinski. She died 2006. Gen 5 and Gen 6 for Peter Okonski of Gen 4 -- Peter was born Jun 25, 1886. Married Anna Warhol on Nov 9, 1910. Peter and Anna had 11 children. Alex Okonski (2nd child) was born Dec 11, 1912. Married Henrietta Gomolka. Died Oct 1978. Harry Paul Okonski (3rd child) was born Sep 5, 1914. Married Mary Ann Gailus. Harry died August 4, 2011. Harry worked at Wrigleys in Chicago and received a Purple Heart that is in the National Purple Heart Museum in New York City (see OkonskiFamily.com) website. 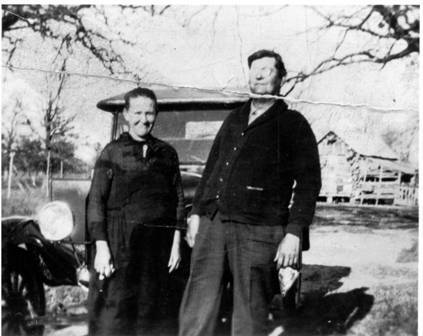 Harry and Mary made many of trips from Chicago to the “Okonski Homeplace” and visited relatives in Bremond, Texas almost annually. Harry and Mary raised 7 children. Valarie (Willie) Okonski (4th child) was born Oct 21, 1915. She married William Pietrowicz. Sadie Okonski (5th child) was born Jan 29, 1918. She married John Stachniak who was born Jan 1, 1914 and died Oct 22, 1990. Sadie married Gordon Campbell Jul 30, 1994. Sadie also made frequent trips back to the “Okonski Homeplace” and also visited where she, Harry and brothers and sisters were born on Tidwell Prarie. Clement Okonski (6th child )was born Mar 25, 1920. William Okonski (7th child) was born Aug 23, 1921 Married Virginia Gregg. Died Mar 19, 2010 and Virginia died Apr 30, 1997. Louis (Ludwig) Okonski (8th child) was born Mar 16, 1923 and died Mar 5, 1933. Raymond Okonski (9th child) was born Jun 13, 1925 and died Jul 1971. Theresa Okonski (10th child) was born on Feb 22, 1928. She married Cyril Niemiec. She died August 11, 1993. Ignatius Okonski (11th child) was born Nov 18, 1929. Died Aug 28, 1949. Gen 5 and Gen 6 for Gen 4 John Okonski -- John was born Dec 17, 1889. Married Veronica Budzis Buckner on Jan 21, 1914. Died Jan 8, 1933. John and Veronica had 4 children. Steve Okonski (1st child) was born Aug 29, 1916. Married Josephine Nobra. Died Oct 14, 2000. Lived all their lives on Tidwell Prairie. 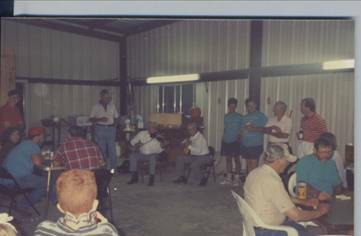 Steve played the fiddle for over 70 years in many cities in Texas for many weddings, reunions, and social functions and is known for some favorite polka and waltz music. Steve and Josephine had 7 children. Christine Mary Ann Okonski (2nd child) was born May 9, 1918. She married Bolaswal (Bill) Bashinski. Died Jan 29, 1969. Josephine Okonski (3rd child) was born Mar 17, 1920. Married Lee Floyd Wachel. Anthony Okonski (4th child) was born Aug 28, 1926. He married Willie Brown Irion. Died Feb 1980. We are also trying to determine any relations to Zbigniew Okonski, Defense Minister of Poland, who negotiated purchase of F16’s with President George H Bush during President Clinton,s term in 1995 and wrote Partnership for Peace: An Essential Element of the European Security System. We also are trying to determine any relations with Walter Okonski, who is the famous author Of Poland’s World War II book. Detail information for Gen 7 and Gen 9 are minimized for security reasons. Again, see the OkonskiFamily.com website for more detail and future updates.